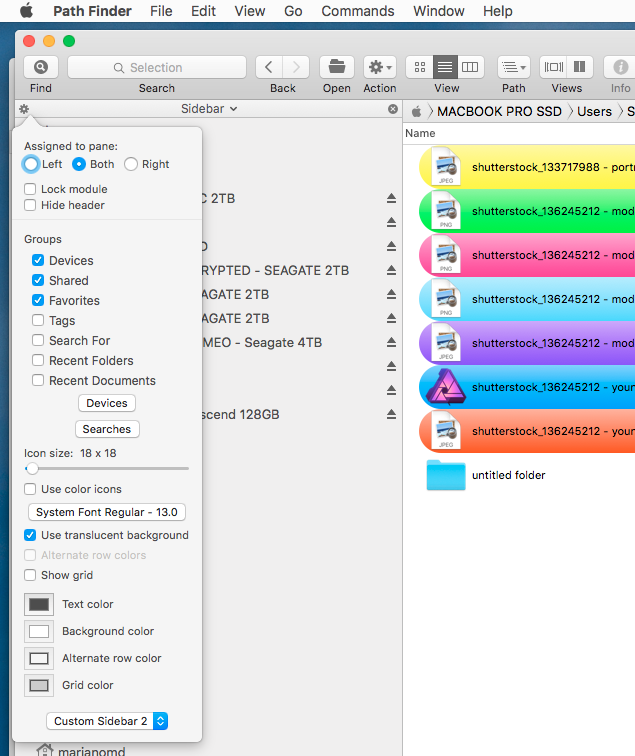 1) I can store a list of Symbolic LInks to my favorite folders in the Finder Sidebar. I use Symbolic LInks because it is easy to rebuild the Sidebar whenever the Finder has a bug that destroys the sidebar contents. PathFinder 7 shows these Symbolic LInks. But PathFinder 8 DOES NOT. This is a significant loss of function between PathFinder 7 and PathFinder 8 - so much so that PathFinder 7 is better than 8. 2) PathFinder 7 allowed you to customize the color of your tags. PathFinder 8 does not. This is a significant loss in customizability. At least PathFinder 8 doesn't use up so much CPU time as PathFinder 7. As far as I know you can only add Folders to the Sidebar - but you can drag symbolic links to the tool bar. A work around is to put what you need in a Folder and place it on the sidebar under favourites, or you can do some variation of this on the Toolbar. Path Finder Support Team closed this discussion on 27 May, 2018 04:53 PM. I already place a folder of Favorite Folders on the Dock. This folder contains symbolic links to each of my Favorite Folders. Yes, Symbolic Links can be placed in the Finder Sidebar Favorites, not just folders. You can also add Aliases to the Finder Sidebar Favorites. The reason I use Symbolic links is that it is easy to rebuild the Finder Favorites Sidebar whenever the Finder's preference file gets corrupted - which can be often. So for PathFinder 8 to lose this capability is very disappointing. So far, the only reason to upgrade from PathFinder 7 to PathFinder 8 is that PathFinder 8 doesn't hog the CPU like PathFinder 7. I often have to use AppTamer to control PathFinder 7's CPU hogging. Otherwise, the lost of the two above features is disappointing. Hopefully, they can be added back. ^ Same here esp. regarding symbolic links in the Favorites sidebar which I used heavily in PF7. I just wanted to open a new thread for that. Sure, I also added the Favorites folder to the sidebar in order have a longer list of places just 2 clicks away. For real favorites (hence the name), though, I want a 1-click-access. I can store a list of Symbolic LInks to my favorite folders in the Finder Sidebar. I use Symbolic LInks because it is easy to rebuild the Sidebar whenever the Finder has a bug that destroys the sidebar contents. Why is it easier to create Symbolic links for rebuild rather than just drag folders to sidebar. Curious, ... I seem to be missing a point here? I use folders from multiple directories all over the hard drive of the Mac and from external drives. I currently have 35 folders in the Sidebar. If you have to rebuild the Sidebar with these folders, you would have to tediously find each folder then drag them to the Sidebar. You would have to remember which folders you also chose to be in the side bar. Rinse and repeat 35 times. It is far easier to store Symbolic Links or Aliases to these folders in a "Favorite Folders" Folder then drag each one to the Sidebar when rebuilding the Sidebar. With my technique, I have no need to remember the locations of the folders, nor do I have to look for them, open up the directory containing each individual folder so I can drag each one to the Sidebar. My technique is far far easier. Path Finder Support Team closed this discussion on 28 May, 2018 01:17 PM. I am having the same problem. Instead of using SymLinks I'm using Aliases. I do this because I can rename the Alias without affecting the name of the folder to which it points. I have Aliases which point to multiple Dropbox folders. If I rename the Dropbox folder then the DB app can't find the correct location and / or my work team sees the updated name. It would be very helpful to be able to put Aliases and SymLinks back into the favorites in the sidebar. Unlike the O.P., I have not noticed high CPU usage on PF7 so, in my case, PF8 is a $20 DOWNgrade. There is no reason for me to invest further in this software if this key feature is not going to be available. Path Finder Support Team closed this discussion on 02 Jun, 2018 05:49 PM. After using Pathfinder 8 for a while, the loss of functions is very very irritating, limiting, and disappointing. 1) NO STANDARD FINDER SYNCHRONIZED SIDEBAR - this use to be the standard sidebar of PathFinder 7. This sidebar allowed the use of Aliases and Symbolic Links in the sidebar. 2) NO ALIASES OR SYMBOLIC LINKS IN THE SIDEBAR - Pathfinder 7 allows this. The Finder allows this. Tag 1 is yellow instead of red. Tag 2 is green instead of orange. Tag 3 is red instead of yellow. Tag 4 is cyan instead of green. Tag 6 is blue instead of purple. Tag 7 is orange instead of gray. In Pathfinder 7 and earlier, I could customize the tag colors to compensate for this bug. But now in PathFinder 8, I cannot customize the tag colors. Very disappointing. Additionally, if the tag colors are too dark to my liking, with PathFinder 7, I could lighten the color. With PathFinder 8's loss of custom colored tags, I can no longer do this. Sad. At the very least, allow the addition of Aliases and Symbolic Links to the Sidebar. This would simplify rebuilding the sidebar from a folder of favorite folders. We are really sorry about this not working anymore. and abandoned a long time ago. In each new version of PF it worked worse. but in this case, it's really Apple to blame. they destroyed a good product !! it's better we ask refound !! @ info: That would be drastic and impulsive. After all PathFinder 7 is still available for download. And it works well with MacOS 10.13. So you can still use the previous version of the product. It looks like Apple has removed the API needed to maintain synchronization with Finder. Thus PathFinder's developers were forced to remove the feature since it could no longer be maintained. 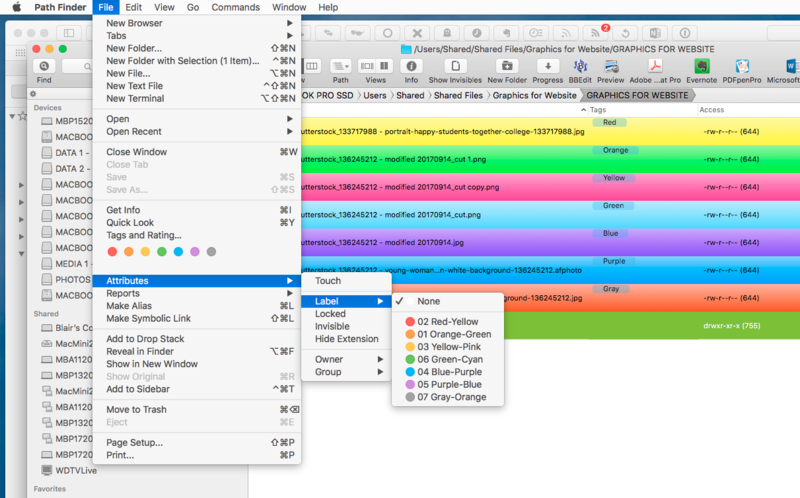 2) add the ability to customize the finder label colors it renders in its own windows. IT IS NOT OBVIOUS as in PathFinder 7. 2) You have to go to the bottom of the Sidebar Preferences to click on the UNLABLED Popup Button. There you select SAVE... to create a custom Sidebar by giving it a name and saving it. 3) You then select from the UNLABLED Popup Button the custom Sidebar you want. Everytime you add or remove a folder to or from Favorites, you have to create another custom sidebar. Otherwise, the newly added folder will NOT be automatically saved by PathFinder. This behavior is different from PathFinder 7 where Sidebar Favorites are automatically saved. Path Finder Support Team closed this discussion on 03 Jun, 2018 07:10 PM. I'd like to add another reason for using symlinks: naming. The name of a folder on my drive isn't necessarily a useful name for the sidebar. Perhaps I also have two folders with the same name, and where they're placed on the drive makes them obvious, but copy those to the sidebar and now I don't know which is which. I'm very disappointed in this upgrade as well, be it Apple or developers. I'm never crazy about paying to upgrade for less. Path Finder Support Team closed this discussion on 06 Jun, 2018 08:19 PM. I am astonished that you find it acceptable to provide an upgrade likely to see customers lose countless hours customising, knowing full well none of it gets saved. I am a long term customer. Version 8 is a disaster. Path Finder Support Team closed this discussion on 06 Oct, 2018 02:15 PM. where have keyboard shortcuts for downloads folder gone in PF8? Path Finder Support Team closed this discussion on 10 Nov, 2018 02:19 PM. After ditching PF couple years earlier for hogging my machine with the PDF preview bug that went unaddressed for far too long, I decided to try it out again. PF8 seemed like a good improvement. I bought the upgrade. Now discovered that my Automator services that I just put in the Services folder do not show up in the contextual menu. They do in Finder. They do not in PF8. I know this was a bug that was present in PF7 at one point and was fixed. Can we please have this looked at again and fixed as well. Thank you! Now discovered that my Automator services that I just put in the Services folder do not show up in the contextual menu. I have some services that I created that work fine. Have you made sure that Pathfinder is a specified application or used apply to "any application"
Path Finder Support Team closed this discussion on 10 Apr, 2019 11:55 AM. Path Finder Support Team closed this discussion on 10 Apr, 2019 10:54 PM.